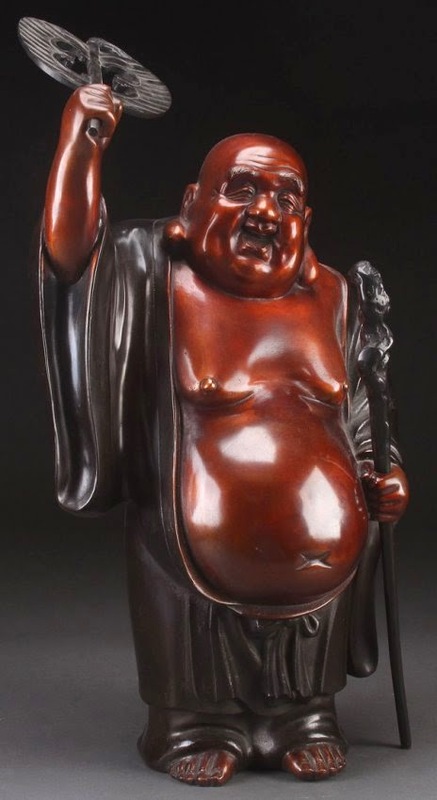 A great souvenir of Japan are the Seven Lucky Gods as small bronze statues. Collecting them over time is something of a badge of honour to many gaijin living here. It shows a kind of affinity with the country and the culture. It also makes it simple to decide on a birthday present. However, although they are known as the gods of fortune in Japan, only one is actually Japanese, Ebisu. Ebisu was born without bones (or in some stories without arms and legs) and grew up in northern Japan bringing fortune to fishermen however the remaining six gods can trace their origins to Chinese and Indian tradition. A little like Santa, they arrive on a Ship of Fortune of Treasure Ship on New Year's Eve and hand out gifts to children. The traditional gift is money, pristine bank notes in an red envelope. Also simplifying the Christmas list. I once shared a New Year's breakfast with the family of a close Japanese friend. This is the equivalent of a Thanks Giving dinner and it was very kind of them to invite me. It's the time the whole family comes together, brothers, sisters, uncle, aunts, everyone at the table. And the children showed me the money they had received and I taught them how to fold the notes into paper planes. Then one pushed the plane up his brothers nose and a sibling battle commenced. And from the look on everyone's face around the table, it was clearly my fault.